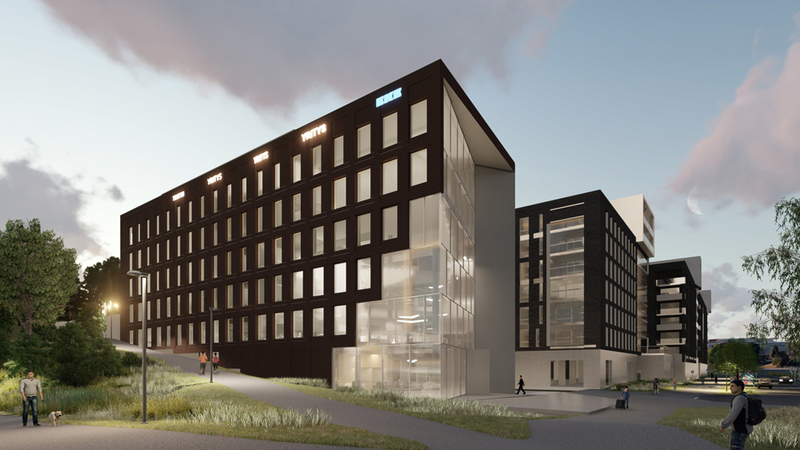 The Piispanportti Office Centre will be located in Espoo by the Länsiväylä motorway, opposite the Iso Omena commercial centre and the Matinkylä metro station. The surface area of the first business premises building of the Piispanportti Office Centre is 4,800 square metres, which provides a working area for up to 420 people. The entire office centre provides a business premises complex of 12,000 square metres. 82 parking spaces are planned for the property. 29 of these spaces provide heating. Where necessary, the number of parking spaces may be increased. The property has a central location at Olari in Espoo. The Länsiväylä motorway is used daily by up to 70,000 vehicles, which gives your business excellent potential for success. The metro station is located approx. 500 metres away, and the centre of Helsinki is within twenty minutes by metro. The airport is 28 kilometres away and the centre of Helsinki 12 kilometres away. The Piispanportti office centre will provide an excellent location for companies hoping to benefit from the potential of the quicklygrowing office and service environment and its connections with the entire metropolitan area. Piispanportti is a modern operating environment where the premises and services provided are designed to be modifiable depending on the user. The launch of the construction is planned for the year 2019. Where necessary, the project may be started more rapidly.